Langkawi is a pleasant island 25km off the west coast of peninsular Malaysia. It is relatively big and developed and has an airport with direct flights to KL. Langkawi has a number of beaches on the west and north coast, some of which are quite nice. 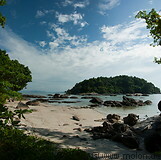 The best beach is Tanjung Rhu on which however there is only expensive Accommodation. The sea water around Langkawi is a bit dirty, but it is possible to reach by boat some islands near Langkawi with good beaches and clear seawater. Langkawi is a relatively upmarket holiday destination.